1.Use DC 5V USB charging port to charge the fan, the red light indicates charging, and will be off after full charged. 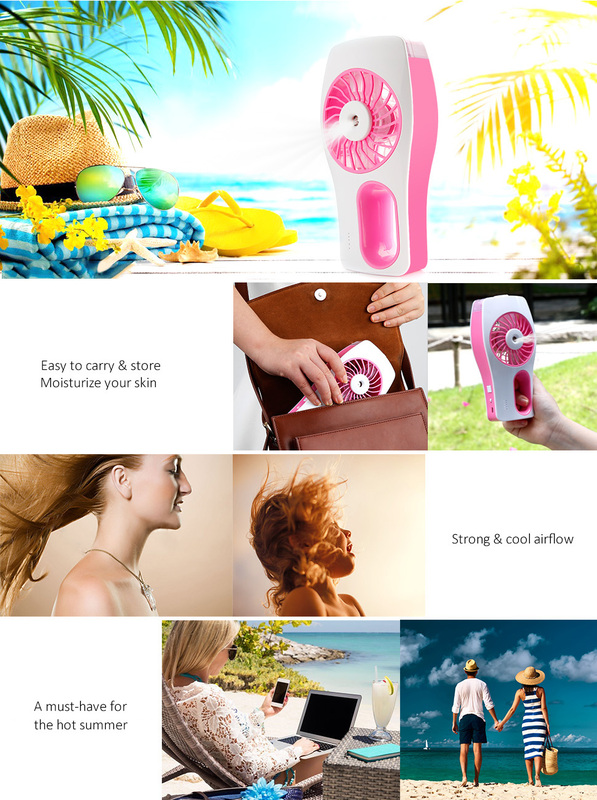 2.Recharge the mini fan if you find the wind force and misty effect not well, it can be charged while using. 4. [2016 Update]Silica gel plug: more compact and anti-spill water; Sink: larger capacity; The unique design of air outlet. 1.Lower power: please recharge the device if you find the wind and misty effect not well. 2.Aqueduct blockage: please shake the water tank a while to make the aqueduct unimpeded. 3.Atomizing transducer blockage: please clean the atomization clip with cotton swab soaked by alcohol or vinegar. Please ensure that your charger is in good condition before charging. Please ensure that there is no water left on the charging port and cable before charging. Don't charge the fan in the humid environment. Please stop charging if the fan or the cable become hotter and hotter.